The data is presented to the user via an on-board LED (see the Buzz-E for an audio output option). The number is presented as a series of blinks of the LED. The number is presented either in Morse Code or as a countable number of blinks or buzzes. In the latter case, the numbers 1-9 are simply presented as the corresponding number of blinks; a special blink pattern indicates the digit zero, and another special pattern indicates a negative sign for temperatures below zero. There is no need for any associated software or other devices to receive data from the AnaSonde Blink-E. Items Supplied With Each AnaSonde Blink-E. 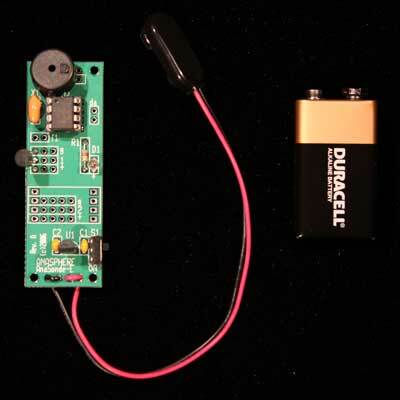 The AnaSonde Blink-E is only offered in kit form; it consists of 10 parts plus a circuit board. All you need to add is a 9-volt battery.